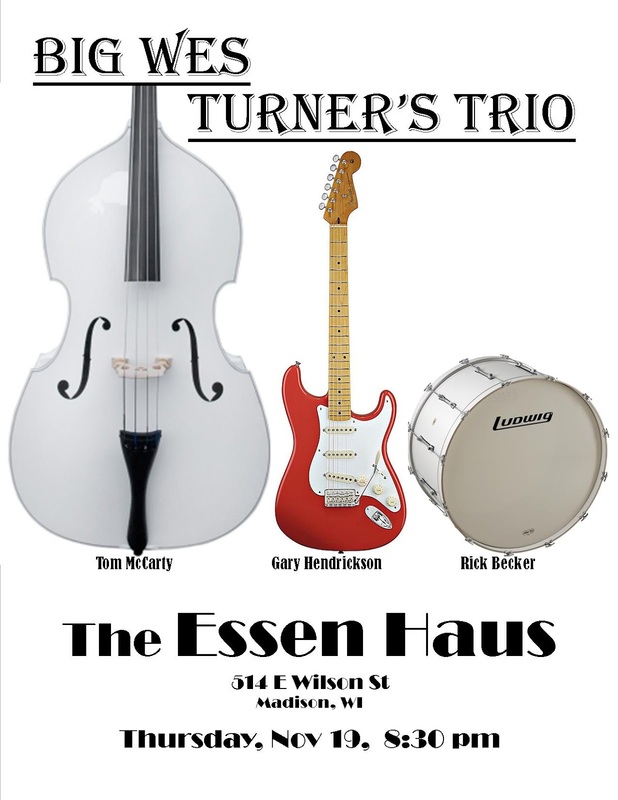 Big Wes Turner’s Trio is back at The Essen Haus this Thursday (Nov. 19). Nov. 25, Birddog & Buddies (with Perry Weber) at Tofflers, New Glarus, WI. Nov. 28, Frankie Lee Trio (with Mel Ford) at Tyranena Brewing, Lake Mills, WI. 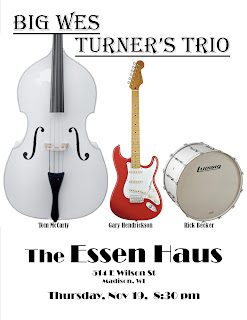 Dec. 3, Big Wes Turner’s Trio at the Essen Haus, Madison, WI. Retrospectively, Mr. McMusic had a rewarding weekend. A successful grand opening of WMRC (Williamson Magnetic Recording Company) on Saturday (Nov. 14) included an amazing, soulful set from Jim Liban and Joel Paterson. I am grateful to have the chance to play with these guys. Congratulations to Mark and Tessa for creating a very special recording and performance space. Next day (Nov. 15), post-game dancing and merriment at Boundaries Bar and Grill, the perfect prescription for recovering from the high drama of the Packer loss. Singer Gary McAdams, guitarist Jeffrey Arnold, and drummer Steve Dougherty made filling in fun and easy. Those deep dives into the memory banks for rock and country classics were wonderfully refreshing. And, Madison Country & Western legend Frank James sat in!